We supply a wide range of standard off-the-shelf optical filters as well as custom parts for specific applications or requirements. We have been a provider of high quality optical filters to the UK market for a number of years with applications including, but not limited to; hyperspectral imaging, water and gas analysis, plasma analysis, thermography, astronomy, UV curing and photolithography. Our standard filter range includes bandpass filters, long and shortpass filters, dichroics, Neutral Density filters and both soft and hard coated components. As well as stand-alone solutions, our filters can also be incorporated into other products that we provide – such as order sorting filters in monochromators, bandpass filters in IR cameras, or heat rejection filters in our broadband incoherent light sources. Please contact us if you have a custom filter requirement or have any questions regarding our standard product range. Andover’s Standard Bandpass filters have been the mainstay of the industry for decades. With Andover's proprietary stabilisation and sealing method these filters will generally last for 10-20 years in the field. Their longevity, coupled with their low cost and ready availability, make these a great choice for most applications. 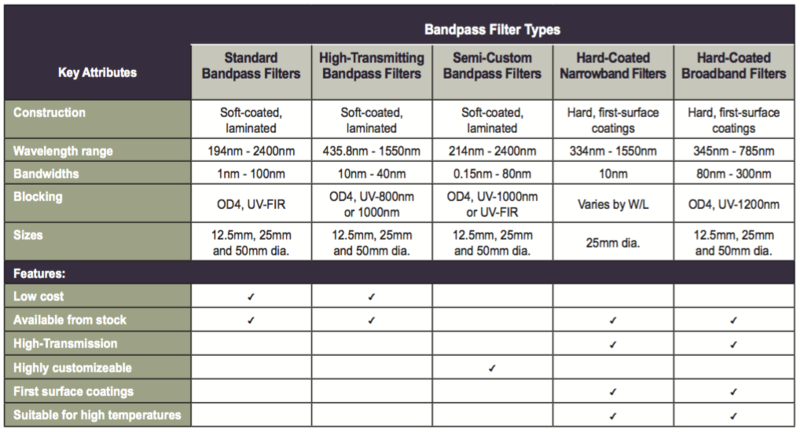 In order to make it simple for customers to custom-tailor a bandpass fillter for their application, Andover offers a line of Semi-Custom bandpass filters. Their construction is similar to both the Standard Bandpass and High-Transmitting bandpass filter offerings. We offer a wide selection of wavelengths, bandwidths and sizes, and offer two blocking options. Andover’s High-Transmitting Bandpass filters are a variant of the Standard Bandpass filter line. Designed for use with PMTs and photodiodes, they employ only dielectric coatings, and have a blocking range tailored to the detector. This results in higher transmission than their fully-blocked counterparts. For your convenience, the high-transmitting bandpass filters are listed in the Standard Bandpass section, and are highlighted for easy identification. Andover offers one of the broadest ranges of hard-coated narrowband filters in the industry. Our filters feature very high transmission, and dense blocking from UV-1200nm. They are suitable for high-temperature applications. This line of hard, first-surface coated filters was designed to cover the standard Raman spectroscopy lines. They feature very high transmission over a broad range about the wavelength of interest. Often referred to as long wave pass (LWP) and short wave pass (SWP) filters, these sharp-cut edge filters are distinguished by their high rate of transition between their region of reflection and transmission. This high rate of transition makes them an excellent choice as emission filters in fluorescence applications, and as order sorting filters in photometry. They are also very useful as stray light or trim filters, to eliminate any unwanted near band radiation. All Andover LWP/SWP filters are constructed of hard, durable first-surface dielectric coatings, and will withstand the normal cleaning and handling associated with any high-quality optical component. Their film construction is essentially a modified quarter-wave stack, using interference effects rather than absorption to isolate their spectral bands. Unlike filter glass, which is not sensitive to wavelength shift with angle, these filters will shift shorter in wavelength with an increase in their angle of incidence. This feature can be useful in applications where it may be desirable to fine tune the 50% cut-on, or cut-off wavelength. All standard edge filters are available in 50nm increments from 400nm to 1000nm. Custom edge filters are available and will be quoted upon request. Dichroic filters (color separation filters) are used in a variety of applications where it is necessary to isolate certain regions of the visible spectrum. A few of the more common applications are for use in colour enlargers and photocopiers as light balancing filters. They are also very useful in any application where it may be desirable to separate the incident energy into two or more light beams. All of the coating materials used in these filters produce hard, durable dielectric films which show no signs of degradation with age and use. Unlike the organic dye or gelatin type which will fade with usage these filters are very stable and should not suffer any loss in efficiency with time. These filters are also available in sets. Andover offers coloured filter glass fabricated from high-quality optical filter glass, precision polished on both surfaces, with options spanning ultraviolet to infrared region. These are available in 25 mm diameter, 50 mm diameter, 50 mm square and 165 mm square sizes. Ultraviolet Cold Mirrors are slightly different than the standard Cold Mirror whereas they efficiently reflect the ultraviolet and transmit the visible and infrared. They are normally used at an angle of 45° and are excellent for applications where one wants to separate the ultraviolet from the visible and near infrared. A Cold Mirror is the inverse of the Hot Mirror, it reflects the visible and transmits the infrared. Their coatings are all first-surface variety and like the hot mirrors, are also deposited onto low expansion material such as borosilicate glass. These mirrors are usually used at a 45° angle of incidence in randomly polarised light. Hot Mirrors perform as their name states: they reflect the heat and transmit the visible light. All of the coatings are classified as hard, first-surface dielectric, and will meet or exceed the specified humidity and abrasion specifications. To prevent cracking or crasing from high heat applications, all coatings are deposited onto a low-expansion material such as borosilicate glass. These filters are very similar to the Hot Mirrors with the exception of their longer IR blocking range. This extended blocking range is achieved by a combination of reflection from the dielectric stack and absorption from an IR absorbing filter glass. Due to this absorption factor, these filters are only useful in low power applications where the maximum filter temperature does not exceed 100°C. In the infrared region of the spectrum, bandpass filters are frequently used for gas analysis applications. Andover offers a standard selection of gas analysis filters at popular wavelengths. These include water vapour, methanol and ethanol, formaldehyde, CO2, CO, NO, FIR Broadband, and CO2 lasers. We can also produce custom filters at wavelengths up to 14µm. Constructed of hard, durable first-surface dielectric coatings on optical-quality IR-transmitting substrates, these filters will withstand normal cleaning and handling associated with any high-quality optical component. Andover Corporation is now offering UBVRI filters as standard items. These filters are used to filter out and measure specific bands of light which are emitted by astronomical objects. Two types are offered: the Johnson/Bessel and the Kron/Cousins. The Johnson/Bessell type is better suited for use with a photomultiplier tube whereas the Kron/Cousins type is better suited for use with a Silicon CCD. Both filter sets work very well but it is important to establish the type of measuring system you are going to utilise before purchasing any sets. Both filter types utilise the same U, B & V filters. The R & I filters for each type are different; they are better matched to the response of the detector being used. Refocusing is always a problem when changing filters. Andover has minimised this problem by grinding and polishing all filters to very precisely controlled thicknesses. The UBVRI filters are available in a range of standard and custom sizes. With the exception of two sizes which are mounted in threaded rings, all other sizes are unmounted. As well as standard bandpass and edge filters, Chroma offers several other varieties of filters, such as notch, multi-bandpass and excitation/emission filters for specific applications including astronomy, Raman, and machine vision. The full range of filters from Chroma can be found on their website, with custom options available for more specific requirements. We can also provide spectrophotometric glass standards intended for use as secondary standards for the verification of the transmittance and absorbance scales of visible absorption spectrometers. Each set contains 3 glass filters for the verification of transmittance and 1 clear holder for use as a balancing filter. The transmission value of each filter is certified by measuring it on a spectrophotometer that has been calibrated with standards that are directly traceable to the NIST. Each filter is mounted in a black anodised aluminum holder, which is compatable with the 1cm cuvette holder, that is supplied with most spectrophotometers. Individual filters are suppled with removeable shutters to protect the filter glass from damage. Every filter set is shipped with a Certificate of Calibration stating the transmission value of each filter at five different wavelengths (440nm, 465nm, 546.1nm, 590nm & 635nm). The transmission accuracy of each filter is certified to be within ±1%. All filter sets are shipped in black anodised metal cannisters which provides maximum protection during shipment and storage. If you already own a calbration filter set, and need it recertified, we also provide services its recalibration. These filter wheels are used for a host of applications, including color CCD photography, fluorescence microscopy, and photometry. Two 4" dia, wheels are available: one which accepts six 25mm filters, and one which accepts twelve 12.5mm filters. Remote or Manual Operation - Filter selection can be made manually from push buttons on the unit, or remotely from either a USB 2.0 or RS-232 interface. Interchangeable Filter Wheels - The 4" dia. wheel is easily changed, allowing quick conversions between applications. Additional wheels are available. Programming and Remote Control - Automation of filter sequences is available through the USB 2.0 or serial (RS - 232 interface) using LabVIEW software for both Mac and Windows platforms. A simple command language facilitates retrieving filter status and making filter selections. The unit comes with the controller, filter housing, filter wheel, and a 5 VDC power supply, and threaded rings to hold the optics in place. A simple, low-cost alternative to the motorised wheel, is our manual filter wheel. Two 4" dia, wheels are available: one which accepts six 25mm filters, and one which accepts twelve 12.5mm filters. Wheels are field-swappable. In addition to our standard rings, Andover offers a variety of threaded ring mounts. Standard sizes and thread pitches enable the user to attach the filter securely to equipment. These filter rings come in industry-standard sizes, are adaptable to most of our standard products, and are laser-engraved for easy identification. The performance of very narrow bandwidth interference filters can suffer significantly due to changes in ambient temperature or aging effects. Elevating the filter temperature can counterbalance aging shifts of up to 0.5nm and also provide a means of tuning the center wavelength to an exact value. As all our filters are bake stabilised to minimise any wavelength shifts with age, the regulated temperature controller provides protection against the influences of fluctuating ambient temperatures. The standard oven accepts a 50mm dia. filter, but we can provide a reducer to accomodate any smaller size. Fuller Epolite FH-5313 is a 100% solid, room temperature curing, electrical grade, epoxy adhesive that has proven to be an excellent bonding agent for ferrite pot cures. This system is designed for continuous operation at temperatures up to 200°F and is available in premeasured kits. • Ideal for bonding a variety of substrates such as metal, glass and plastic. • Excellent chemical resistance, mechanical strengths and electrical properties. Diamond-like Carbon (DLC) is a hard durable coating with useful properties as an infrared optical coating. The coating is a mix of graphitic and diamond forms of Carbon. As a result, the film structure has no long range order and cannot be fractured. The presence of the diamond- like form imparts a hardness that cannot be matched by other coating materials typically used in the design of infrared optical coatings. The refractive index of DLC is about 2.0 and this makes it an ideal coating material for use as an anti-reflection coating when applied to higher index infrared optical materials. The infrared materials Germanium and Silicon have high refractive indices of 4.0 and 3.4 respectively. Typically, the higher index materials are used as the first lens of an infrared lens assembly due to the high refractive power. The first lens is subjected to a harsher environment and the increased durability afforded by the DLC coating greatly enhances the protection of outer facing lens surfaces. DLC is a chemically inert nonporous coating with the high hardness associated with diamond. Therefore, it will easily survive exposure to harsh environmental testing such as 10-day humidity, acidified salt fog and severe abrasion. There is even a sand slurry wiper blade test specific to DLC that demonstrates its’ superior abrasion resistance compared to other infrared coating materials. We (in conjunction with Andover Corp products) can offer DLC as an option on Germanium or Silicon lenses and windows when durability and optical performance is desired.